The cultural impact of the American fairy tale The Wonderful Wizard of Oz has not diminished since the publication of L. Frank Baum's original book over 100 years ago. If anything, the story has become more beloved over time, spawning numerous revisions, interpretations, and sequels. The story has been adapted for almost every format, including theater, radio, animation, and film. Of course, the most famous adaptation of the story is the 1939 MGM movie musical The Wizard of Oz, starring teen actress Judy Garland (1922–1969) as Dorothy Gale, the Kansas girl who travels to a fantastical land to learn the lesson that "there's no place like home." Integral to this lesson are Dorothy's magical Ruby Slippers, given to Dorothy by Glinda the Good Witch and desperately coveted by the Wicked Witch of the West. Since 1939 the Ruby Slippers have become one of the most iconic and recognized movie costume pieces in the world. The pair possessed by the National Museum of American History is one of our most popular attractions, demonstrating the personal connection that generations of audiences have felt with the film. But the museum's holdings related to the Wizard of Oz go beyond the slippers. We have also been fortunate to acquire other objects related to the film—important pieces that help us to further preserve and explore this shared piece of our cultural history. Some, like the camera that recorded the beloved film, are currently on display. 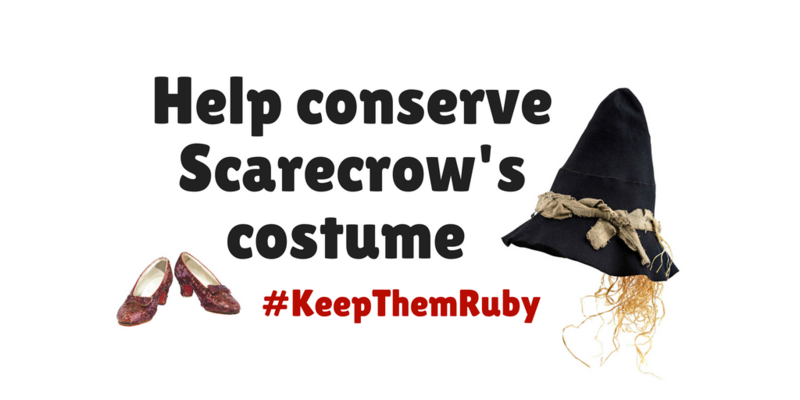 Others, like the costume pieces worn by the Scarecrow, are off display and in need of conservation care in order to be on view as part of our culture exhibition, opening in 2018. Ray Bolger (1904–1987) wore this costume in the film as the Scarecrow, the character who wished he "only had a brain" and became the first of Dorothy's newfound friends met along the yellow brick road. After filming, Bolger used the costume in his personal act; it was donated to the museum after his passing. The donation also included extra straw used in film production. Unfortunately the Scarecrow costume is very fragile and sensitive to light. In order to preserve it for the future, it is rarely exhibited for long periods of time. E. Y. "Yip" Harbug's hopeful lyrics made the film's signature ballad "Over the Rainbow" an instant favorite with 1939 audiences. The song, with music by Harold Arlen, won an Academy Award for 1939 and quickly became a national standard. Today it is still performed by artists worldwide. This Technicolor camera was one of several used in the filming of The Wizard of Oz. The camera recorded on three separate negatives—red, blue, and green—that were then combined to develop a full-color positive print. The box encasing the camera, a "blimp," muffled the machine's sound during filming. The museum has a complete copy of an early version of the film's screenplay, written by lead scriptwriter Noel Langley. The scene in which the film changes from black and white to color is indicated in this page. As you can see by this handwritten note, the shoes are still being characterized as "silver" in this version of the script, as that was their color in Baum's book. The color was later changed to the familiar iridescent red by Langley and costume designer Gilbert Adrian to better capitalize on the film’s use of Technicolor. These are a just few of the objects that help museum curators interpret the legacy of Baum's book and The Wizard of Oz movie. Why do YOU think the film has been an enduring favorite?